"Multimedia systems and applications such as surveillance, social media and networks, and cloud computing have conflicting goals. How do you balance increasing system capabilities and preserve privacy of users? We seek to achieve this balance by building models and algorithms in the area of multimedia analysis." "The solution of a problem lies in understanding it." Cloud-based multimedia systems are becoming increasingly common. These systems offer not only storage facility, but also high-end computing infrastructure which can be used to process data for various analysis tasks ranging from low-level data quality enhancement to high-level activity and behavior identification operations. However, cloud data centers, being third party servers, are often prone to information leakage, raising security and privacy concerns. In this research, we present a Shamir's secret sharing based method to enhance the quality of encrypted image data over cloud. Using the proposed method we show that several image enhancement operations such as noise removal, anti-aliasing, edge and contrast enhancement, and dehazing can be performed in encrypted domain with near-zero loss in accuracy and minimal computation and data overhead. Moreover, the proposed method is proven to be information theoretically secure. Further details and demos can be found here. A secure and privacy-aware cloud-based architecture for online social networks (Collaborator: Kasun Senevirathna). The use of social networks has grown exponentially in recent years, and these social networks continue to have an ever-increasing impact on human lives. There are many concerns regarding the privacy of users in these environments, such as how trustworthy the social network operators are, in addition to the external adversaries. We propose a new architecture for online social networking, based on distributed cloud-based datacenters and using Shamir's secret sharing as the method of encrypting user profile data, for enhanced privacy and availability. Cyber bullying detection using social networks analysis (Collaborators: Qianjia Huang and Vivek K. Singh). This research focuses on using social network analysis and content textual features to detect the cyber bullying cases. First, based on related literature from social science and psychology, we built three hypotheses for the differences between cyber bullying and non-bullying cases. Then, by adding 1.5 ego-network graphs from two users in a conversation, we can build and learn the relationship graph of these two users. After gathering the social network data, such as relationship tie, number of friends, and social network centrality, we find that multiple social characteristics are statistically different between the cyber bullying and non-bullying groups, thus supporting the results found in previous psychological studies. Finally, the cyber bullying detection models have been significant improved by adding social network features compared with only using textual features. Scalable secret sharing of compressed multimedia (Collaborators: Shreelatha Bhadravati and Majid Khabbazian). Traditional secret image sharing methods have an all-or-nothing property, which is not suitable for applications which require gradual reconstruction. In this paper, we propose a scalable secret image sharing (SSIS) method that provides gradual reconstruction with smooth scalability. Furthermore, we extend this method to videos and propose a scalable secret video sharing (SSVS) method. These two methods are designed for compressed multimedia (i.e. JPEG images and H.264 videos). In both methods, the size of the shadow images (shares) is reduced to an optimal value. Experimental results and analyses show that the proposed methods are computationally and semantically secure. Collective control over secrecy of sensitive video evidences(Collaborators: Saeed Alharthi, Abed El Saddik and Md. Anwar Hossain). Today digital video is used extensively in many applications. Sometimes a video could be treated as a top secret for an organization, for example military secrets, surveillance footage and corporate product designs, and may need to be shared among a group of people in a secure manner. Traditional data security methods such as encryption techniques are prone to single-point attack, i.e. the secret can be revealed by obtaining the decryption key from any single person. Alternatively, the secret sharing scheme provides collective control over the secrecy of information and is considered information theoretically secure. In this research, we propose to adopt a secret sharing based approach to provide collective control over a given sensitive video. We present three methods that utilize the spatial and temporal redundancy in videos in different ways. We analyze the security of these methods and compare them for efficiency in terms of computation time and space using extensive experimentation. Data set used for this research has been made public. For more details, please click here. Novel methods for digital image watermarking (Collaborators: Gaurav Bhatnagar, Jonathan Wu, Himanshu Agarwal and Balasubramanian Raman). Surveillance and monitoring systems generally employ large number of cameras to capture people's activities in the environment. 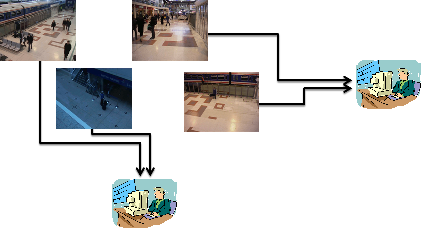 These activities are analyzed by hosts (human operators and/or computers) for threat detection. In order to meet the real-time requirements of surveillance, it is necessary to distribute the video processing load over multiple hosts. In general, cameras are statically assigned to the hosts; we show that this is not a desirable solution as the workload for a particular camera may vary over time depending on the number of the targets in its view. In the future, this uneven distribution of workload will become more critical as the sensing infrastructures are being deployed on the cloud. In this work, we model the camera workload as a function of the number of targets, and use that to dynamically assign video feeds to the hosts. Experimental results show that the proposed model successfully captures the variability of the workload, and that the dynamic workload assignment provides better results than a static assignment. This camera placement in a bus is often performed manually based on human intuition and knowledge; however, there is no scientific basis to justify: (1) how many cameras would be sufficient, and (2) where (location) and how (with what orientation) they should be placed, to increase the area of coverage at the minimum cost. This research addresses this issue by breaking it down into two separate problems: MaxGain and MinCost. The MaxGain problem is aimed to maximize the overall coverage with a specific number of cameras; while the MinCost problem attempts to minimize the number of cameras to cover a specified area in the bus. The solutions to these two problems are presented. 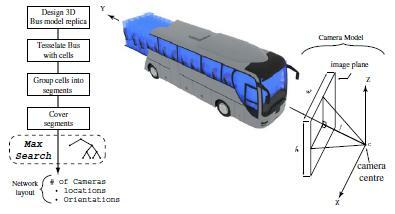 The proposed method computes the approximate coverage of a camera inside the 3D bus model. Furthermore, in order to improve the efficiency of the solution, an algorithm called "SmartMax" is proposed. The proposed solution advises precise locations and orientations (pan and tilt angles) of required cameras and can be used to validate the current camera installations in various types of public transit buses. The video demo is available here. In current video surveillance systems, camera views are monitored via remote security personnel. If a serious incident such as gun shooting occurs, it can take time for security to arrive at the scene. During this time, the assailant(s) may cause considerable damage and endanger many lives. Ergo, this research investigates feasible disabling devices that can be augmented with camera systems to disable the assiliant(s) and minimize the loss of lives of innocent citizens. For more details, click here. Be alert, somebody is running and shouting in the corridor..., hmmm... How to assimilate the information from multiple heterogeneous sensors in order to detect such events? For more details, please see: Information assimilation for event detection (Collaborators: Mohan Kankanhalli, Ramesh Jain, John Oommen, and Namunu Maddage). Where to place the sensors for effective surveillance...? For more details, please see: Optimal Sensor Placement (Collaborators: Mohan Kankanhalli, G. Shivaram, Vivek K. Singh and K R Ramakrishnan). Who has left this item in the hallway...? This might be dangerous... How can sensors actively compete and cooperate with each other to detect the abandoned object, identify the person and his/her movement? For more details, please see: Active Coopetitive Sensing and Coopetitive Multimedia Surveillance. (Collaborators: Mohan Kankanhalli and Vivek K. Singh). Be careful... a sleepwalker is walking out of the house during sleep... system should alert the caretaker. For more details: Sleepwalker Monitoring (Collaborators: Abed El Saddik and Md. Anwar Hossain). Can you believe...? 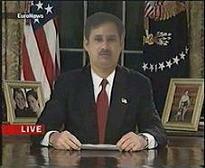 This is 'Pradeep' addressing United States from Washington DC... OR Is it media tampering...? 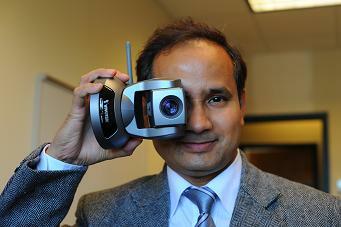 For more details, please see: Digital video authentication (Collaborators: Mohan Kankanhalli and Weiqi Yan). This research advocates for the web sites to have trust levels for various domains. It would allow the web users to see web information along with its trust level. Determining the trust level of the web information will also significantly help in performing trust-based search. We aim to design and develop algorithms to dynamically compute the trust level of a web site for a particular domain based on the past history of semantic agreement/disagreement between this web site and a trusted web site in that domain. (Collaborators: Abed El Saddik, Sheela Ramanna, Hicham Ibrahim and Md. Anwar Hossain). Web services are usually selected and composed based on their reputation. In general, the reputation of a web service is computed using the feedback provided by the user. However, the users' feedback bears many problems including a low incentive for providing ratings and a bias towards positive or negative ratings. In this research, we proposed a method that overcomes the dependency on users' feedback for computing the reputation of web services. The proposed method dynamically computes the reputation of a web service based on its association with the other web services. The association coefficient between any two web services is computed by utilizing the statistics of how often they have been composed together. This factor is considered in our method to show the evolution of reputation over a period of time. The experimental results demonstrate the utility of the proposed method. (Collaborators: Abed El Saddik and Md. Anwar Hossain).